I could feel every eye on me as I boarded the public bus. Wishing for less attention, I discretely grabbed a hanging strap, and stood near a window. The red in my cheeks dissipated after coins clunked in the tray, guessing incorrect fare. The driver pulled from the curb. I was the only tourist on the bus, but through the reflection on that sunny afternoon in Seoul, our bodies swayed as one. Ear buds dangled from ear canals, locals barely spoke. Faces covered by umbrella shadows blocked out sunshine. Bandanas, fabric or masks covered mouths. 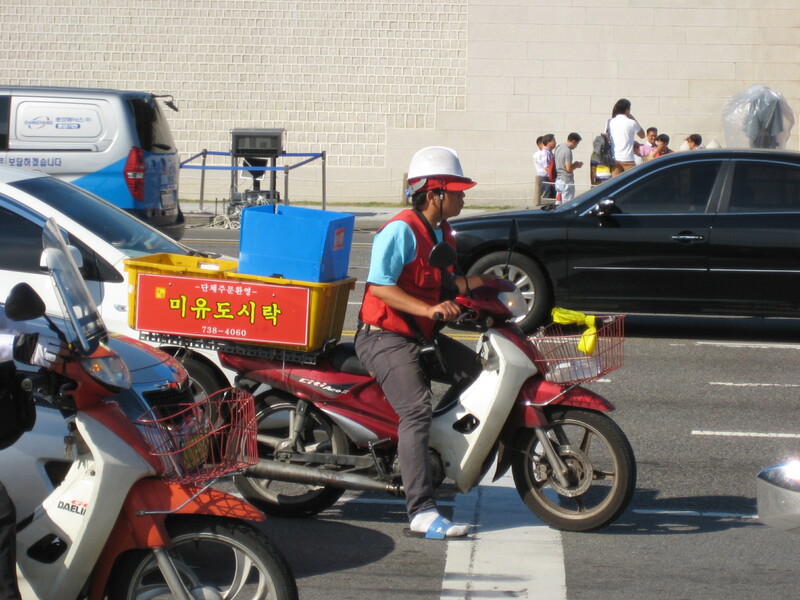 Pedestrians did not stay to consistent sides, so I slalomed bodies, and dodged mopeds delivering take out upon sidewalks. 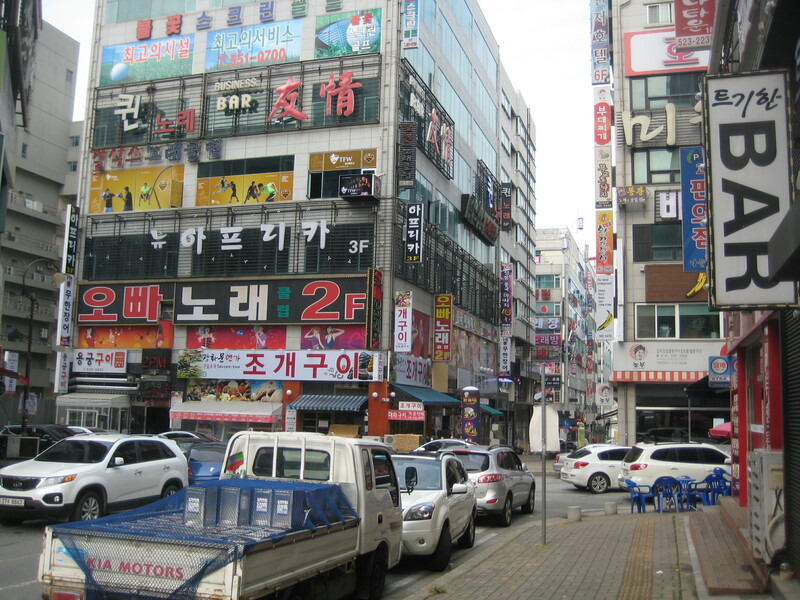 There are few things that ripple my skin like an eel out of water, but visiting South Korea, alone, without linguistic knowledge exceeded my comfort zone. I could not read anything. I was stared at everywhere I went. 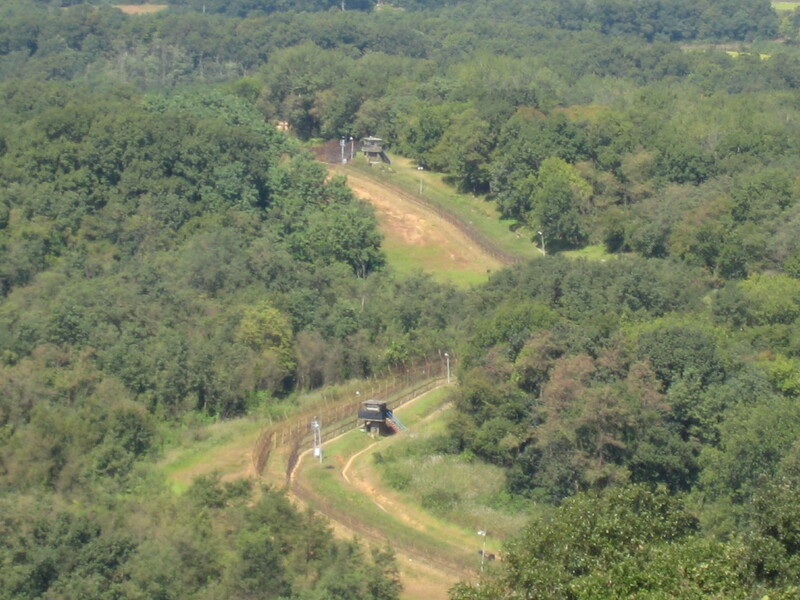 Countryside passed beyond my window seat from Cheonan to Seoul, arriving without a hotel, map or itinerary. Traveling freely is often exhilarating allowing my heart to lead, witnessing locals in routine, capturing non tourist scenes into memory. 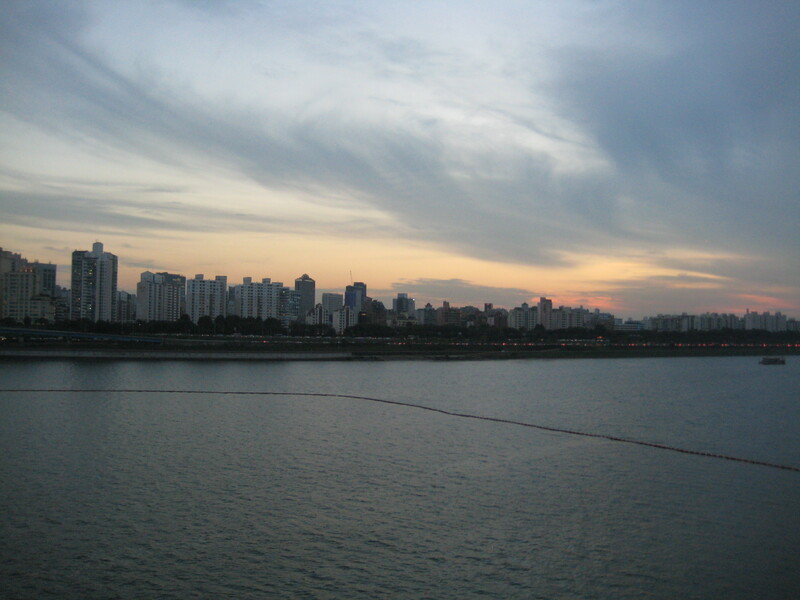 I found myself alone, on a bridge in Seoul as the sun was setting over the Han, without a destiny. Just a passport, backpack and 360 degree view of a city beneath a purple hue. I turned in circles taking in different vantage points, as the bridge I stood upon shook from traffic. My soles explored for hours until ankles swelled, blending into tree trunks. A blister formed beneath my foot, armpits sore from friction. I was thirsty, fatigued and my belly hurt, but I kept exploring, in search of a room. About defeated, I made out five precious letters creating the word hotel. Climbing a dark stairwell, the stained carpet told me to run. Too exhausted to care, I traded 70,000 South Korean Wons for a key. 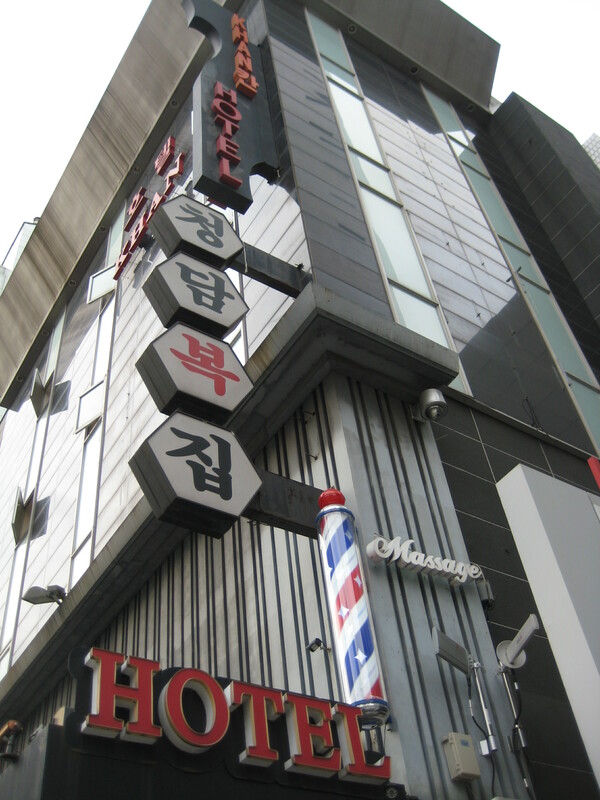 It was an establishment my friend referred to as a “love hotel.” Oh, sweet, Jesus! The clerk gave me condoms at check in. A mirror dangled from the air conditioner, an armless clock hung from the wall. I collapsed in my clothes, exhausted beneath a chandelier and sparkly ceiling. I was grateful to be safe, behind a secure door allowing rest. To avoid repeating this fine experience, the next morning I entered the shiny Riviera. Language barriers in my favor, I was directed to their business center. I viewed a map and typed rapidly before they realized I was not a guest, and booked two nights at the G Guest House, in Itaewon. I mastered the rail system, utilizing maps below-ground. 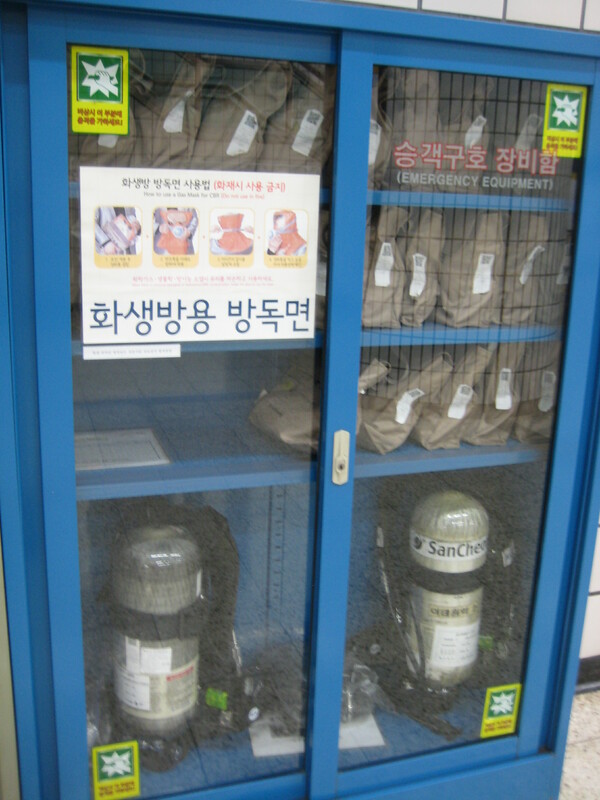 Gas masks in glass cases in stations stopped me in my tracks. 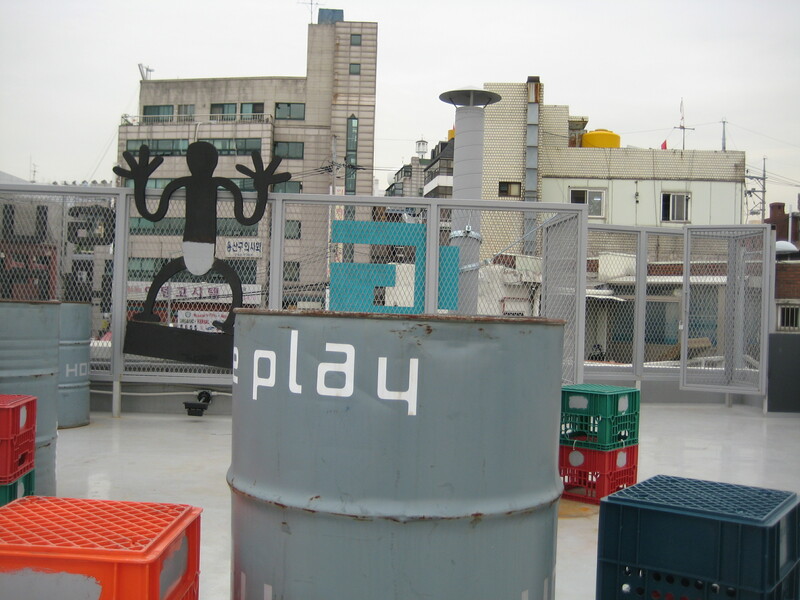 I collapsed on my bunk, in Itaewon. My body had traveled hours into the future, and was acting opposite of natural light. In search of The Gak Won Sa Temple, a driver signaled for me to exit in a desolate town. I followed three women beneath hats and umbrellas up a quiet street, passing red peppers drying in the sun. 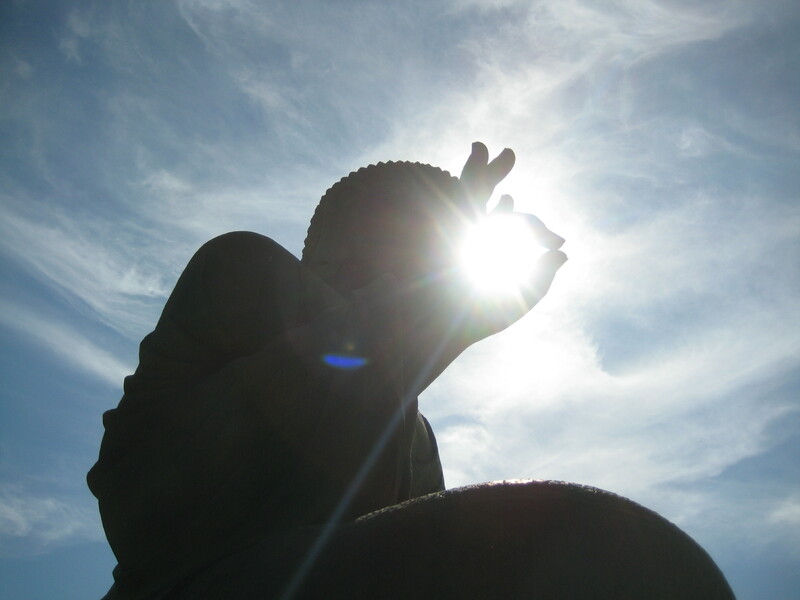 Reaching the peak of a tall staircase, my gaze fell upon a massive Buddha statue. He was stunning and green. Strolling a circle around him, sunlight shown through his fingertips in an okay gesture, directed at my heart. A reminder to stay in the moment, releasing anxiety about locating a bus back. Gorgeous buildings with intricate rooftops sat peacefully within a country setting. Entering the Temple, I lowered upon a brown cushion in awe of such a beautiful space, closed my eyes and listened to a monk. I scooped unknown lunch fare onto my plate. A challenge traveling adhering to The Specific Carbohydrate Diet, but there I sat in a lunchroom in South Korea, eating Kimchi, with borrowed metal chop sticks. No one joined my table. A choir rehearsed through open windows as I washed my dishes, then rested upon a rock in view of the Buddha. A dragonfly rested on my body, peering beneath movie star glasses. These fragile creatures remind me of my late grandfather. I always smile. I did push-ups on a rooftop, as laundry turned with a man from Indy, and accepted his challenge to run sprint intervals along the river. We passed locals, bags in hand, lined upon sidewalks to purchase vegetables. It felt awesome pushing my body fast as I could between cement piers, igniting my competitive spark on foreign soil. 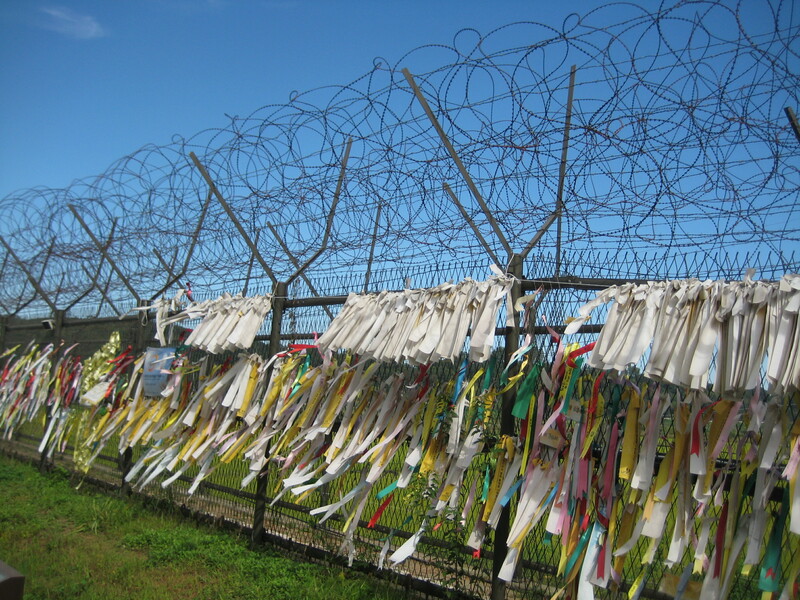 Waiting for a DMZ tour, a native spoke of the suicide rate due to pressure placed upon students. A bus picked us up, a Korean militant boarded, making me uneasy as he looked us in the eyes, individually, then sternly at our passports. 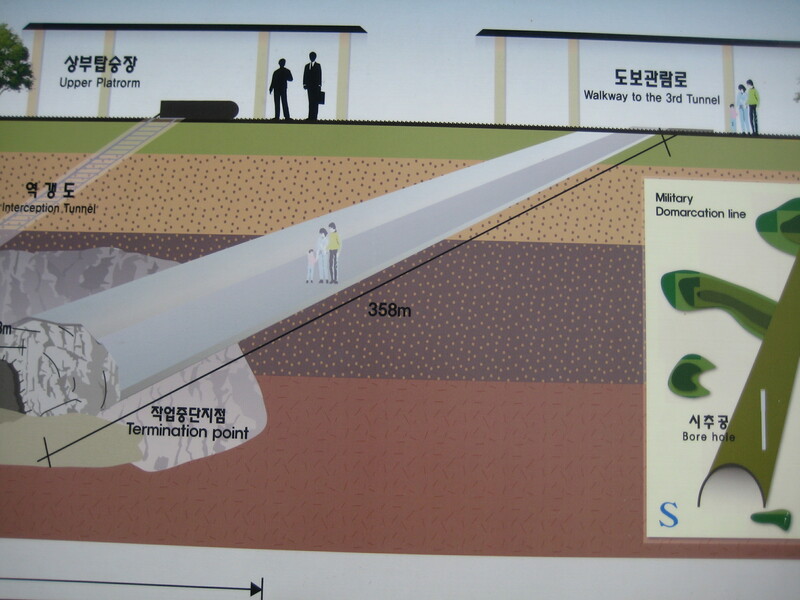 We were admitted into The Demilitarized Zone, the soil separating North and South Korea. Lush green rice fields, wire fences and men in watchtowers were beyond our window panes. We were informed of a propaganda village across the border, and of wealthy farmers who tend the fields on this tense land. The end of the tunnel stood a cement barricade. When it was my turn, I peeked through a tiny window as far as a civilian could view. Humans created this against humans. It looked like a horror film. We toured the eerily clean Dorasan rail station. It sits waiting, anticipating future change, glistening with hope that perhaps one day, South Koreans can take a train to Paris. Flags tied to fences swayed in the wind, with inscriptions to loved ones across an uncrossable border. Back in the city, a tiny girl in uniform beneath an umbrella said hello to me. She was so brave and could already speak two languages. It warmed my heart after days of little communication, lacking means beyond pointing or smiling. It took the entire visit to properly pronounce hello and thank you, in Korean. Walking up Namsans hill at dusk, I based my route via sight of the North Seoul Tower. City lights glistened from afar. Reversing my route at dark was not seamless. Seoul is massive. I got spun around, but eventually located a PC room to get my bearings. I interrupted the attendant from gaming to change the language on my screen. With help of an online map, I got back safely. Moments like these grow thicker Octopi skin, and bring alive precious stories. Korean food intrigued my taste buds. Street food was incredible, pigeons danced around the square. They really are a worldly bird. I love travel stories I find myself a participant in, when things are not easy. There is so much to learn. All the books in the world could not capture the awareness I gain by exploring new cultures. 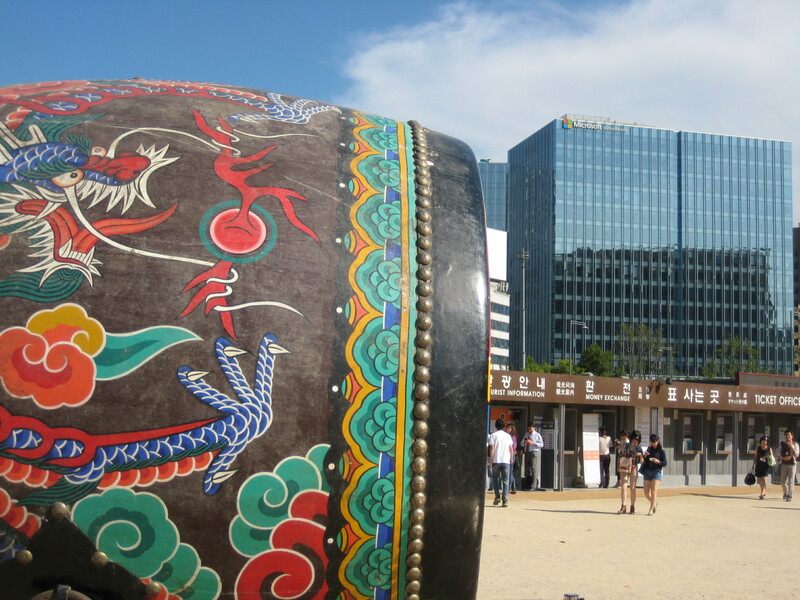 Despite moments of trepidation and exhaustion, I found a real warmth in South Korea. I heard my friends laugh again, in person, and met his beautiful wife and son. A guesthouse owner laughed as he sawed off a lock to free my passport, as my bunk mate slept. An entrepreneur welcomed me into her beautiful space, hosted a rooftop movie night, and translated conversations into English. The owners of a store invited me in for Lotus tea and conversation. My friends rented a karaoke room to be silly in and cooked a traditional Korean dinner over heat on our table, with side dishes to try, and Soju to sip. 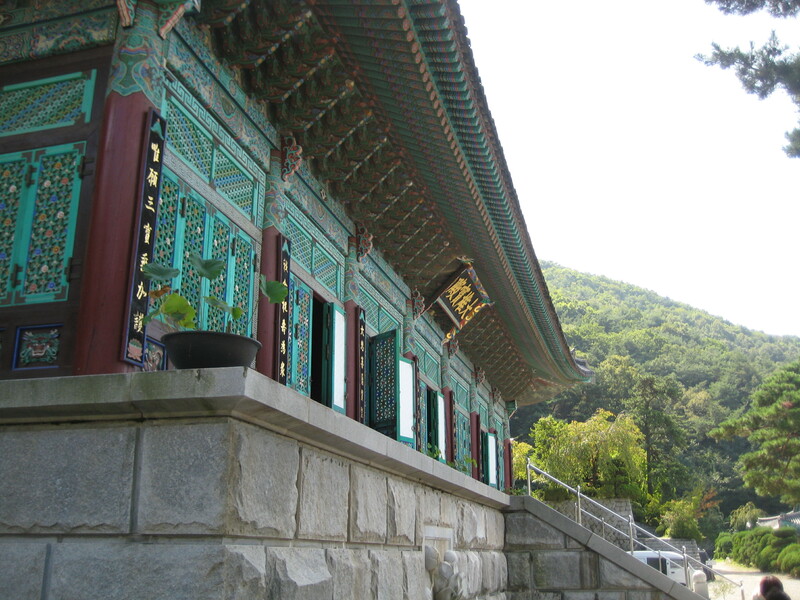 I walked upon Gingko berries and visited the Korean Ginseng Center. I meandered down alleys, peered in shop windows, and restaurants of every ethnicity. One man tried to sell me an entire hanging chicken. 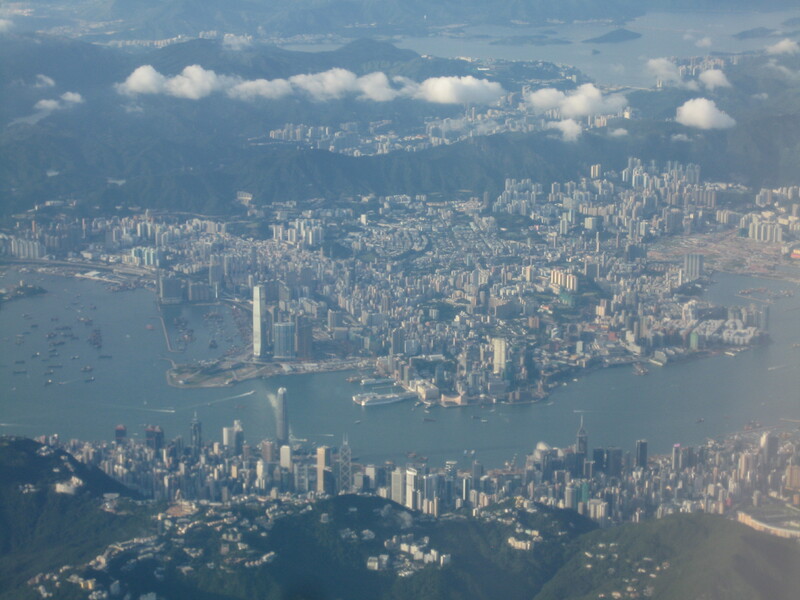 En route, I had a world class nap in Hong Kong International, drooling like a baby, alongside a suit. I fell in love with this city the instant I peeked beneath my window shade. Her skyline and topography was beautiful. Ominous mountainous peaks poked through lingering clouds. Asia, a dichotomy between the ancient world and new. History and technology embraced these cities, yet stood apart like smoke between glass walls in a coffee shop. What a journey! I haven’t been back since leaving at 4. I wouldn’t know what it’s like there except for photos like yours. Thanks for reading! I hope you get a chance to return, see the country and taste all the flavors!